This freestanding precast concrete bike rack has six bike slots and 1" rolled bar loops bolted to the base which allow users to securely lock their bikes with various bike locks. 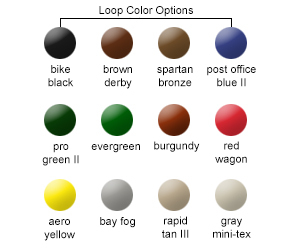 Loops are powder-coated in your choice of colors shown. 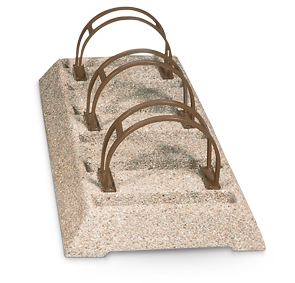 Concrete aggregate serves as an appealing base that blends well with any outdoor setting. Treated with water-repellent sealer to enhance the appearance of the stones, help prevent water, salt or dirt penetration and cracking, and most importantly, extend the life of the aggregate by forming a protective barrier against the elements. Manufactured from high quality aggregates to ensure all requirements are met according to ASTM standards. Heavy-Duty steel reinforced construction makes this concrete bike rack an excellent choice for commercial as well as residential use.